One of my most favorite things is talking to authors and helping them manage their publishing adventure. I've spent nearly twenty years in the self-publishing field, including writing, designing (both book interiors and covers), publishing and e-publishing, marketing and website design. 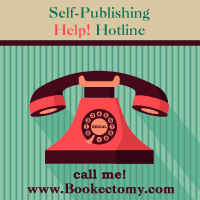 I decided to offer an easy-to-access, quick-call "hotline" designed to help publishing authors find reliable, honest, experienced answers specific to them and their book. • Or anything in between! The questions below are among the those I commonly answer. While there are many general answers, I find that each author and each book is unique. The right answer for you may not be the right answer for someone else. During these calls, I strive to discover what your particular needs are and what the best route for you may be. • How do I ensure my book will be available for sale online and at bookstores? • How do I protect my copyright? • How do I know if my marketing plan is working? • What can I learn from my book sales reports? 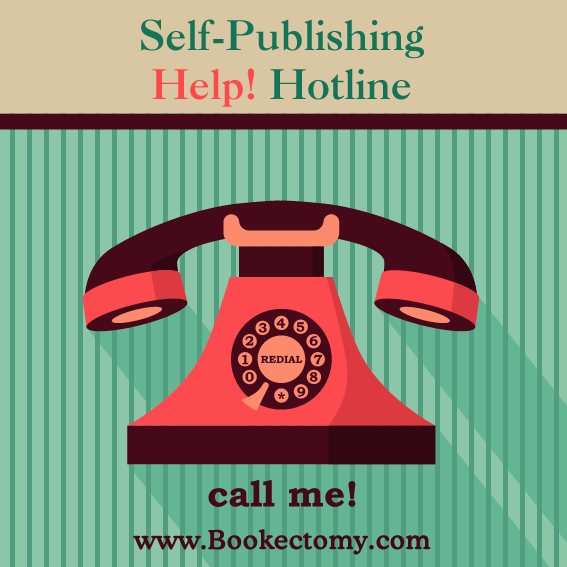 • Where should I purchase my ISBNs? • Should I publish with CreateSpace or IngramSpark (or other)? • Should I use CreateSpace’s Expanded Distribution? • How do I get into libraries? • What do I need to know while I am still writing my book? • How do I create a professional cover? • What mistakes should I watch out for inside my book that will separate the pros from the amateurs? • What do I need to know about my book images? • What is “fair use” and what can I safely “borrow” to use inside my book? • What margins, fonts, styles, can I use? • How do I price my book? • And many more. . . ! ! 1. Select the amount of time you need for the questions you have to ask. Note that calls cannot be extended past their allotted time so choose appropriately. 2. Click to pay for your call and choose a time slot. My call scheduling service limits to twenty-four hours in advance. If you need a same-day call, email for availability. “Emergency” calls on weekends or holidays are 50% more, when available. (No calls are available on Easter, Thanksgiving, Christmas, or New Year’s Day). 3. At the scheduled time, dial the number and we will chat! 4. Ask me anything about the writing, publishing, marketing process. I’ll answer truthfully (good or bad) and to the best of my nearly twenty years of experience in the self-publishing field. • I offer no instruction on how to use software, such as what settings, etc. Most of this is available from the printer and there are too many options, platforms, types of software, computers, for me to keep up on all of them. • No refunds. You may reschedule up to two (2) times, then your call time and money is forfeited. • If any caller becomes profane or inappropriate, the call will end immediately and there will be no refund or second chances. • I tend to err on the side of too much information, so if you want a short-and-sweet answer, just let me know. • Calls can be recorded at your discretion. Click the "Book Appointment" Button to Schedule Your Call!